This Stuffed Artichoke recipe was inspired by Buddy from the Food Network series Kitchen Boss” He stuffed the cleaned artichokes raw and then steamed them in chicken broth, it seemed logical and so much easier than cooking them, cleaning them, stuffing them and recooking them. The nice thing about this stuffed artichoke is it can be prepped in advance. The filling made, covered and refrigerated. The artichokes prepped and refrigerated in acidulated (lemon and water to prevent oxidation) water. The nice thing about this stuffed artichoke recipe is it can be prepped in advance. The filling and the artichokes prepped and kept separately in the refrigerator. Combine the lemon juice in a large bowl filled with ice water. Cut the stems off each artichoke and trim the top by slicing off one-inch, which also helps expose the interior of the artichoke. Trim the tips off each leaf with a pair of kitchen shears or ordinary scissors and rub the lemon over the exposed cuts. Stretch the center open and with the tip of a tablespoon remove all the hairy insides and discard. Place each prepped artichoke and the lemon rinds in the acidulated water. At this point, you can cover and put in the refrigerator until you are ready to stuff and cook. 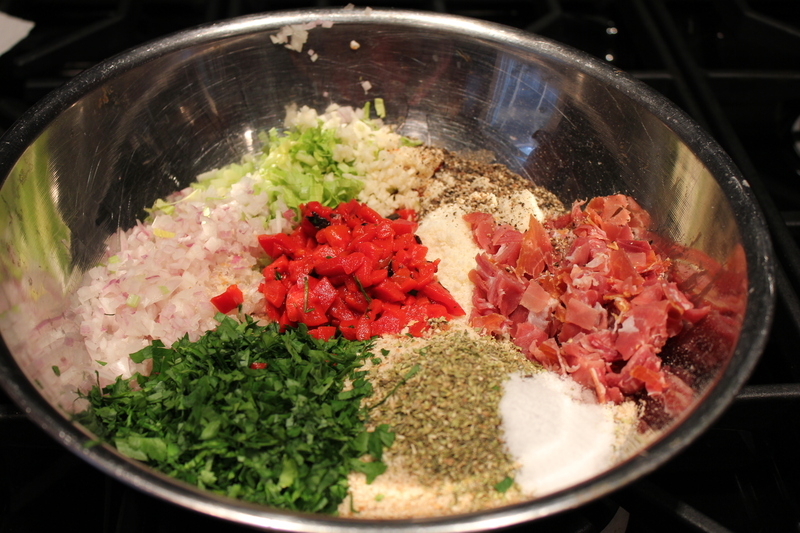 Combine the breadcrumbs, cheese, shallots, celery, pepper, parsley, prosciutto, garlic, salt, pepper, and olive oil in a large bowl. Remove an artichoke, shake out the excess water, and spread the leaves. Place 1/3 (large artichokes) or 1/6 (small artichokes) of the cubed mozzarella in the center and in leaves around the artichoke. Now fill the artichoke with 1/3 or 1/6 of the breadcrumb mixture and set in a large Dutch oven. Repeat procedure until all artichokes are stuffed. Add wine and enough chicken stock to come halfway up the sides of the artichokes. Shave fresh Parmesan, using a vegetable peeler, over the top of each artichoke and spoon a little broth over the top. Cover the pan, set over high heat until boiling, the reduce heat, and simmer for 40 minutes for large artichokes / 20 minutes for small artichokes or until the bottom is tender – insert a sharp blade through center filling into the bottom of the choke, they are ready when there is no resistance. Remove each artichoke to a warm serving bowl, one-half a large artichokes per person or one small. Serve with some of the broth in bottom of the bowl for dipping.